Barrington abounds in delightful bits of scenery, but by far the most beautiful spot within its borders is Nayatt Point. No one gazes upon it from the waters of the bay, or drives quietly past its well-kept lawns, without bestowing a spontaneous tribute of admiration. - William H. Munro, 1881. Nayatt Point Lighthouse circa late 1800s. Courtesy of Lighthouse Digest. Providence was a thriving center of transportation and commerce by the early 1800s. It became clear that a lighthouse was needed, not only to guide vessels into the Providence River, but also to mark the narrow passage between Nayatt Point and the shoal extending out from Conimicut Point at the opposite side of the river entrance. Congress appropriated $3,500 for the lighthouse on May 23, 1828. Work progressed quickly and soon a 23-foot octagonal brick tower was completed along with a five-room, unattached stone dwelling. The first keeper who appears in the payroll records was Daniel Wightman, who remained until 1845. His pay was $350 yearly. The report of Lt. George M. Bache of the U.S. Navy, dated November 22, 1838, provides much detail. The focal plane of the light was 38 feet above sea level, and the lighting apparatus consisted of six lamps and reflectors. The concave reflectors were said to be much worn and full of indentations, and two of them were bent from their original forms. According to an 1859 report, the upper part of the tower was “very much cracked,” and the structure was leaky. The dwelling was also reported to be leaky, with some shingles missing from the roof. A storm in January 1855 did much damage, and the authorities decided a new tower was in order. Two appropriations of $6,500 each were provided for the work in 1855 and 1856. A new 25-foot-square brick tower was completed in 1856. It was attached to the 1828 dwelling by means of a new one-story brick wing added on the building's northwest corner. This wing was raised to two stories, with a gable roof and chimney, about 1905. The tower remains largely unchanged today. A door on the lighthouse's south side leads to a cast-iron spiral stairway leading to the cast-iron lantern room. The new tower exhibited a navigational light for only about a dozen years. A new granite lighthouse was established offshore to mark Conimicut Shoal, and the light at Nayatt Point was extinguished for good on November 1, 1868. The fourth-order Fresnel lens was transferred to the new structure. The dwelling at Nayatt Point was retained for use as a shore station for the keepers of Conimicut Light. Keeper Davis Perry rowed back and forth from Nayatt Point—about a mile each way—to tend the new beacon. Several keepers and assistants came and went in the next few years, all of them often hindered by the elements during the treacherous commute across the channel to the lighthouse. 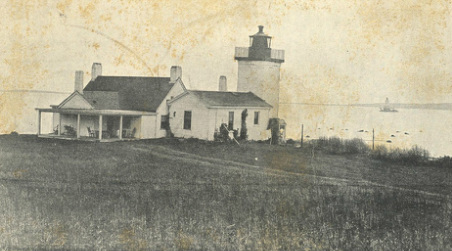 After a new sparkplug-style lighthouse with integral living quarters was built at Conimicut Shoal in 1883, the property at Nayatt Point was sold to Charles Merriman for $4,000. The 1828 house is Rhode Island's oldest lighthouse keeper's house, although there have been additions to the structure. David Reynolds, author of the National Book Award-winning biography Walt Whitman's America, grew up in this lighthouse. He has said that living so close to nature helped him identify with Whitman's own love of nature. Len and Barbara Lesko owned the Nayatt Point Lighthouse in recent years. Len Lesko is a professor of Egyptology at Providence's Brown University. He used the former keeper's office as his study, even using an original 1828 built-in desk overlooking the bay. When severe weather threatened, the Leskos sealed up the building with heavy hatch covers over all the doors and windows. They never experienced any major storm damage, but did find quahogs on the roof after Hurricane Bob in 1991. The Leskos sold the property in 2001 after owning it for 18 years. The buyers in 2001, at $1.375 million, were Dr. Neil Feins, a professor of surgery at Harvard Medical School, and his wife, Christine Feins. A Fresnel lens from a lightship is now in the lantern room. While the light is operational, it is not an official aid to navigation. In a 2013 interview, Dr. Feins said he likes to keep the light on for the benefit of local boaters, who occasionally crash onto the rocky shallows near the house. 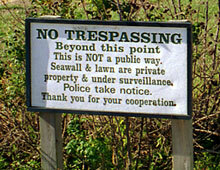 You can get good views of the old lighthouse and Conimicut Light from a nearby beach, but keep in mind that the lighthouse is private property and trespassing is not allowed.